Red, dry, itchy eyes can be annoying and painful, but ultimately are only temporary, right? “My red eyes will go away if I just get a bit more sleep or when allergy season ends,” you may tell yourself. But many don't realize that not all red eyes are the type of minor conditions that don't require treatment and will likely resolve themselves naturally given enough time. Sometimes, your red, dry, itchy eyes are an indication of dry eye syndrome. Your eyes will require treatment in this case, and knowing the difference between these two very similar conditions is essential for avoiding extended discomfort. In the case of red eyes that are accompanied by significant pain or a fever over 101 degrees Fahrenheit a eye doctor near Glendale or Peoria, AZ should be consulted immediately. This may indicate a larger problem. As a general rule, however, red eyes are not a sign of conditions that require an eye doctor visit, and require no specialty treatment. Red eyes generally clear up by themselves over time. Red eyes caused by allergies may return to normal within hours of the allergen being removed, whereas in the case of conjunctivitis and similar infections, it may take longer. With these infections, as much as a few weeks may have to pass before your red eye clears up and your eyes return to their normal white. Dry eye syndrome can be caused by a number of factors including your body's changing hormones and illnesses such as lupus or rheumatoid arthritis. Dry eye sufferers may also be especially susceptible to side effects of some medications known to trigger dry eye symptoms. Though dry eye syndrome has no definitive cure, many options exist for relief of symptoms. A special type of eye drops exist that are meant to imitate the natural tears produced by your eyes. These are called artificial tears, and are the most often prescribed product for dry eye relief. Different types of artificial tears are formulated for different ways in which dry eye syndrome manifests itself. Some artificial tears will help reduce the shortage of real tears being produced by your eyes, while others will attempt to aid in construction of the parts of your tears' make-up that are naturally flawed. Speak to your optometrist about choosing the type of artificial tear that will help you the most. You can also help yourself by avoiding situations that are known to trigger dry eye symptoms such as dry environments, dusty outdoor settings and smoke. 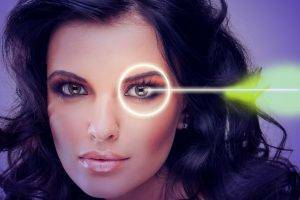 For questions and more information, consult your eye care professional in Phoenix, AZ today.